Draft Beer Towers Portfolio from ACU Precision Sheet Metal. For the best in Draft Beer Towers, it’s ACU Precision Sheet Metal! We’ve got a wide variety of Beer Towers ranging from Column Towers, T- Towers, Pass Through Towers, Bridge Towers, Under Bar Towers, and Metro Tee Towers we’ve got the Beer Tower your bar needs! ACU Precision Sheet Metal has the right Beer Tower for you here at ACU Precision Sheet Metal and if you do not see what you may need we can build any custom beer tower for you! 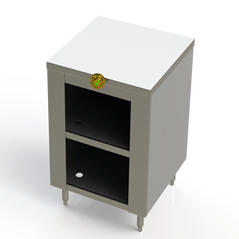 The T-Towers are designed to mount to one or more pedestals. T-Towers are made of 18 ga. Stainless Steel in #4 brushed or #8 mirror finish or 16 ga. Brass #8 mirror finish. T-Towers can be almost any length. The removable faceplate can have any variable faucet configuration you specify and can be easily replaced to change configuration. T-Towers come with Styrofoam and Rubatex insulation and Neoprene gaskets to aid in keeping product cold. Pedestals come in either 3" or 4" diameter. The flanges on the pedestals are welded to the tubing thus eliminating dirt catches and producing a smooth seamless joint. The flanges are press formed from a single piece of material and have 4 countersunk holes for mounting. The Metro Pass Through Tower has two 4" diameter base tubes and a 3" diameter faucet tube. The Metro Pass Through Tower come in Stainless Steel in #4 brushed or #8 mirror finish or Brass #8 mirror finish. Each Metro Pass Through Tower can have any variable faucet configuration. The Metro Pass Through Tower come with Neoprene gaskets to aid in keeping product cold. Each Metro Pass Through Tower comes apart for ease of installation. The flanges are press formed from a single piece of material and have 4 countersunk holes for mounting. The Metro Tee Tower has a 4" diameter base tube and 3" diameter faucet tubes. The Metro Tee Tower come in Stainless Steel in #4 brushed or #8 mirror finish or Brass #8 mirror finish. 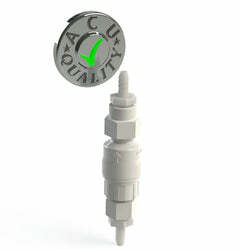 Each Metro Tee Tower can have any variable faucet configuration. The Metro Tee Tower come with a Neoprene gasket to aid in keeping product cold. Each Metro Tee Tower comes apart for ease of installation. The flange is press formed from a single piece of material and has 4 countersunk holes for mounting. Our Pass Through Towers come in either 3" diameter or 4" diameter X .060" wall tubing. Pass Through Towers come in Stainless Steel in #4 brushed or #8 mirror finish or Brass #8 mirror finish. Each Pass Through Tower can have any variable faucet configuration. 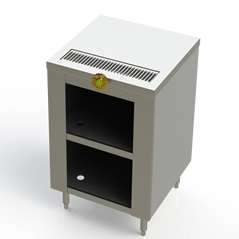 Pass Through Towers come with Neoprene gaskets to aid in keeping product cold. Each Pass Through Tower comes with an access panel for ease of installation. The flanges are press formed from a single piece of material and have 4 countersunk holes for mounting. The tubing we use on our Bridge Tower is 4" diameter X .060" wall. Bridge Towers come in Stainless Steel in #4 brushed or #8 mirror finish or Brass #8 mirror finish. Each Bridge Tower can have any variable faucet configuration with any number of sections. The flanges are made from a single piece of 1/4" material and securely welded in place. Column Beer Towers "Draft Arms" come in either 3" or 4" diameter with 0.060" walls. Draft Arms come in Stainless Steel in #4 brushed or #8 mirror finish or Brass #8 mirror finish. They come with Rubatex insulation and a Neoprene gasket to aid in keeping product cold. The removable cap makes it easy to assemble. The flanges are welded to the tubing thus eliminating dirt catches and producing a smooth seamless joint. The flanges are press formed from a single piece of material and have 4 countersunk holes for mounting. A Draft Beer Tower is the Trophy at the Bar! Presentation is part of the art of a great draft beer! Whatever type of beer you are serving, using draft beer towers are an important role to be proud of how you pour. Create a mood and an atmosphere that compliments the rooms decor by choosing the right beer tower. Draft beer towers are available in a variety of body styles and a number of beer faucet hole sections. 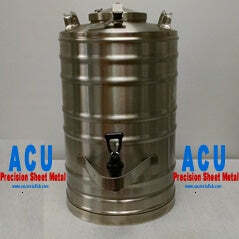 ACU Precision Sheet Metal can also provide custom draft beer towers. As of a matter of fact, we have a whole special department that is building custom Draft Beer Towers all day long! Are you looking for a draft beer tower with a slightly different twist? Or do you need a few simple changes to fit your specific application? We can help. ACU has the capability to manufacture custom draft beer towers and draft beer drip trays to meet all your dispensing requirements. Just give us a call or give us a chance to quote your dream tower here.